Hashino Blast Furnace (橋野高炉跡) is historic site of Kamaishi, Iwate Prefecture. It was the first western style blast furnace in Japan. It was built in 1858 and designated as UNESCO World Heritage Site. This blast furnace helped the revolution of Japan at the end of Samurai Era. Today, this site still has the stone structures and ruins. No admission. Open 24 hours. In winter, it will be very hard to watch because of Heavy Snow. Hashino Blast Furnace is one of the "Sites of Japan’s Meiji Industrial Revolution: Iron and Steel, Shipbuilding and Coal Mining" of UNESCO World Heritage Site located in Kamaishi, Iwate Prefecture. It is the oldest western style Blast Furnace in Japan. It was built in 1858 and produced Steels until 1894. At the peak, it produced over 1,125 tons of steels and 1000 people work at this place. The 3 ruins of blast furnaces of this place are remaining in great conditions and the entire site are preserved well. It is also registered as the national historic site of Japan. 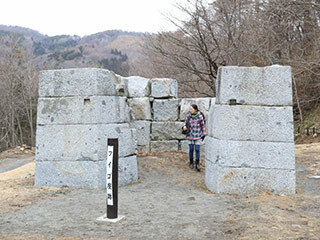 Granite can be seen around the remains of the Hashino Blast Furnace. It is believed that it was created 140 million years ago from lava which rose to near the surface of the earth and slowly cooled down. On the south side, geological features- mainly garnet and epidote - were created through the melting and transformation of rock by the lava. They contains both iron ore and copper ore. The Hashino Blast Furnace used iron ore as a raw material for manufacturing iron and garnite as the material for the walls of the blast furnaces and the canals.